Kiran Santosh Choudhari from Navi Mumbai, Diploma Graduate. ELECTRICAL MAINTENAN.. COMMISIONING ENGINEE.. MANUFACTURING MACHINERY MAINTENANC..
are one of expert skill area's of Kiran Santosh Choudhari . 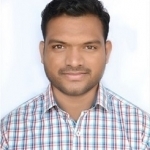 Kiran Santosh Choudhari is working in Power and Utilities industry.